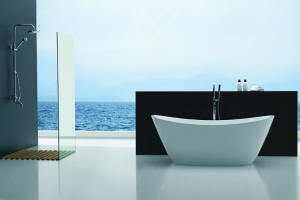 Your shower is one of the most critical parts of your home, doubling as both a bathing and relaxation space. Your shower head can make or break your overall shower experience, making it either uplifting and refreshing or uncomfortable and unsatisfying. Finding a new shower head isn’t a complicated process with the virtually endless options on the market. What makes the process challenging is that there are so many options that it can be tough to narrow them. That’s why we’ve created this guide to the best shower heads for this year, so you can find the right one for your bathroom and family. The following shower heads are the ones we picked for our shower head reviews based on customer feedback, features included in for the price, and their performance. The fixed Speakman Anystream High Pressure Adjustable Shower Head has a higher price point than others on our list, but its high-performing design and easy setting changes may be just what you’re looking for in an upgrade. ShowerMaxx Shower Head Premium is a handheld shower head that could be beneficial for families with young children to bathe. The ShowerMaxx can work with both high and low water pressure homes. For a low price, the Hydroluxe Handheld-Shower Combo packs in several features that make it functional for the everyday family. With five water flow settings, everyone can find one they prefer. SomovWorld Ultra High Pressure Shower Head is a basic, fixed shower head that can increase water pressure in homes where it’s low. 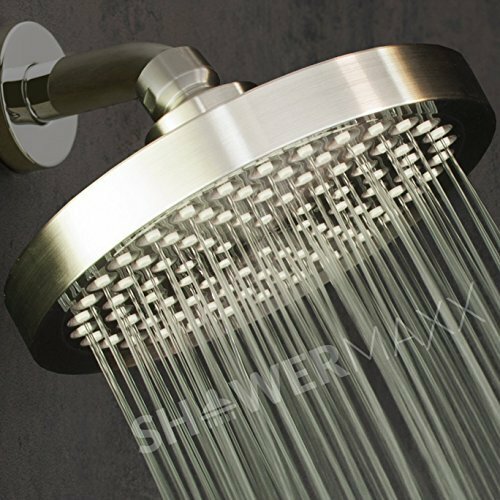 If you’re in the market for a spa-like shower experience, the ShowerMaxx Premium Luxury Spa Rainfall Shower Head may be your best option. This wall-mounted head can give your bathroom a quick, budget-friendly upgrade that feels like a luxury. Our best shower head reviews cover five very different shower heads to give you an idea of some essential features to look for and to help you find one for a variety of budgets. 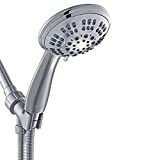 The Speakman Anystream High Pressure Adjustable Shower Head is pricier than other fixed showerhead options, but it also has an excellent, long-lasting performance that could be worth the money. 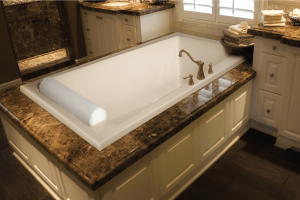 And, with six different finishes, you’ll likely find one that matches your bathroom’s design with ease. One of the standout features of this showerhead is its unique handle design that switches between water settings. You can move between intense, rain, and other settings by rotating the handle instead of relying on clunky switches that tend to stick over time. 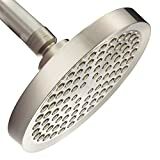 Customers appreciate how much pressure this small shower head puts out and several agree that, although it’s heavier than other showerheads, it’s easy to see and feel the difference between this one and lower-quality heads. The ShowerMaxx Shower Head Premium is one of the brand’s most popular handheld showerheads with three different finishes – brass, chrome, and nickel – to fit seamlessly within your bathroom’s design. The hose stretches over 6-feet to give you plenty of room to maneuver it in your shower space. With a large 4 ½-inch faceplate, you’ll get a lot of water coverage in your shower. One of the best things about this showerhead is that it’s versatile. 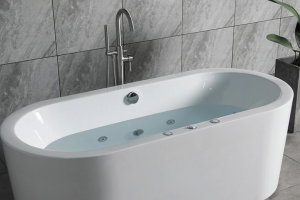 Not only does it have six different water flow settings, including circular massage and rainfall, but you can also set it on water-saving mode if you have high water pressure, or power massage to give it some extra power in low water pressure homes. With the additional water flow reducer disc that you can remove, virtually any home with high or low water pressure could benefit from this showerhead. Some customers agree that the hose isn’t as flexible as they prefer but that the showerhead offers them a lot of comfort and convenience paired with an appealing design. The Hydroluxe Handheld-Shower Combo might be one of the best options for families with kids, pets, or multi-use bathrooms. With both a fixed and a handheld showerhead, each member of your family can use what they need. Not only can you shut off one showerhead and use the other, but you can use both together and choose from five water flow patterns, like mist or water-saving rainfall. Switch between the settings with an easy-to-use click lever. 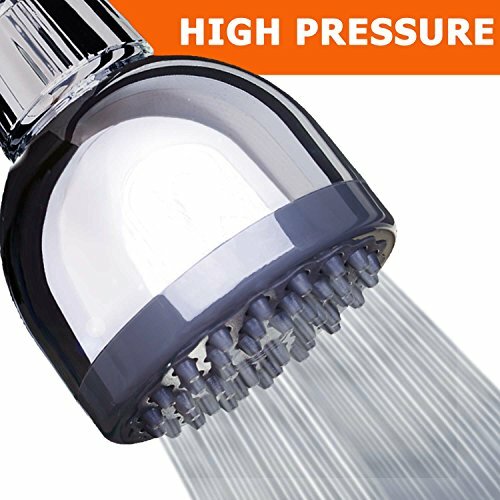 This showerhead may be a good option for people with normal to high water pressure, since the water flow reducers don’t remove easily and may impact the shower head’s performance if they are removed. Most customers agree that this showerhead gives them a lot of versatility in the shower and offers just the right amount of water pressure with each of its settings. 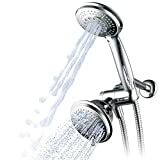 SomovWorld’s Ultra High Pressure Shower Head is a basic, fixed showerhead that could be the right option for a spare bathroom that doesn’t need a lot of frills. This unit is ideal for homes with low water pressure, as its design allows you to remove the water flow restrictor and also pumps up the efficiency of water movement. This showerhead is compact with a 3-inch face, but the jets help to force water outward in a way that makes the spray area wider in your shower, covering more of your body at one time. One beneficial feature of this showerhead is that both the jets and face are silicone, making it simple to clean and keep clean to prevent hard water and grime from building up. Several customers agree that this showerhead gives them the right water pressure, regardless of their low or high pressure. The ShowerMaxx Premium Luxury Spa Rainfall Shower Head can be ideal for people who want a luxurious upgrade for their shower without paying an extravagant price. For under $40, you can install this fixed rainfall showerhead to your current arm and experience a similar type of water flow as high-end ceiling-mounted rain showerheads. This showerhead will tilt wherever you need it to go in the shower, thanks to the 360-degree adjusting ball joint. With the purchase of an extension arm, you can even have the showerhead parallel to the floor for the ultimate rainfall experience. The smooth finish on the face of the ShowerMaxx makes it easy to wipe off regularly to reduce buildup that can affect the performance of the jets. 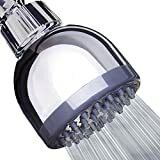 People who have purchased this showerhead say that the stylish design of it gives the bathroom a simple upgrade that doesn’t break the bank and its easy installation is a welcome bonus. 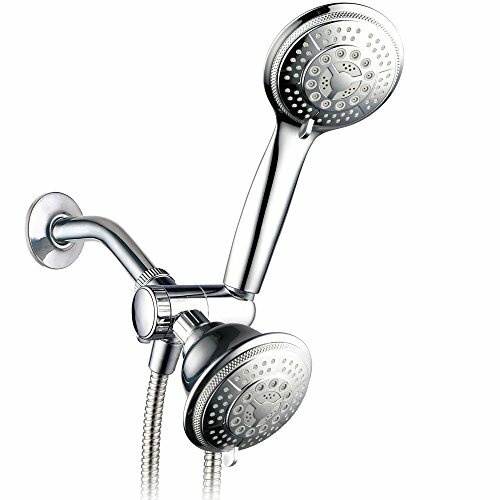 What type of Shower Head is Right for Me? Here, we’re going to talk about some of the features you’ll find in the best shower heads and what makes them different, so you can choose the options you need most. There was a time when you’d need to choose between saving money and getting all the features you’d want in a luxury shower head. Fortunately, technology is getting more advanced and it’s cheaper than ever for companies to make luxurious shower heads. 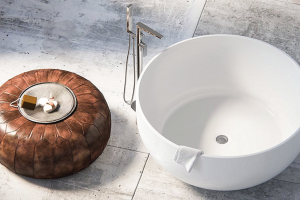 Therefore, you can usually get a high-end shower head for a decent price. Still, you don’t want to pay for anything you don’t need, so you should consider what’s most important to you, who will be using the shower head the most, and what makes sense for your bathroom. For example, you may prefer to save money on a shower head for a guest or kid’s bathroom but splurge on the one for the master bath. Shower heads can either attach to the wall or ceiling in a fixed position, meaning that you can’t remove them in the shower, or they can be handheld, connected with a hose so that you can move the shower head around while you bathe. Handheld showerheads are especially helpful for families with children or pets because they give you more flexibility to move the water where you need it, such as rinsing off a child’s head of shampoo or spraying off dirty paws. Handhelds are typically a bit more expensive than fixed models. 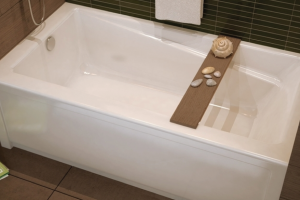 You can also find a combination fixed and handheld unit that includes both, which is ideal for bathrooms that get a lot of use by different people and pets. 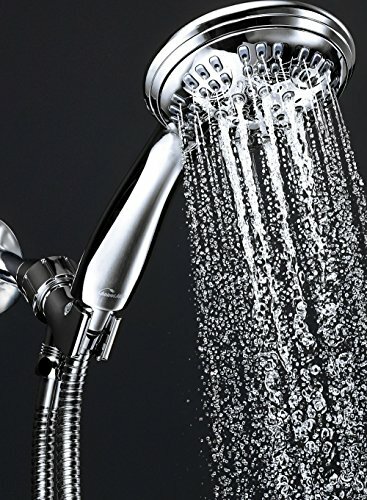 Consider your home’s water pressure before purchasing a shower head. If you’re not sure if you have low or high water pressure, consult with an experienced plumber to find out. Most shower heads have a water-saving or water-reducing device included to reduce high water pressure and save money on your water bill. If you have low pressure already, though, this won’t help you much and may make the shower head unusable. In some cases, you can remove the device, but you’ll want to find a shower head that explicitly says it’s removable. If not, you could damage the shower head’s performance. Other showerheads are designed to increase low water pressure by moving water efficiently through the unit, but homes with already-high pressure won’t benefit from this feature. Multiple Settings or Single Setting? Do you prefer to have different water flow options available when you take a shower, like a massaging pulse or a rain-like spray? If so, then a multi-setting showerhead may be your best option. Extra water settings tend to make showerheads a little pricier than single-setting models and the settings may not always work well with very high or low water pressures. We offered quite a variety of the best shower heads on today’s market to meet the needs of most homes and families. 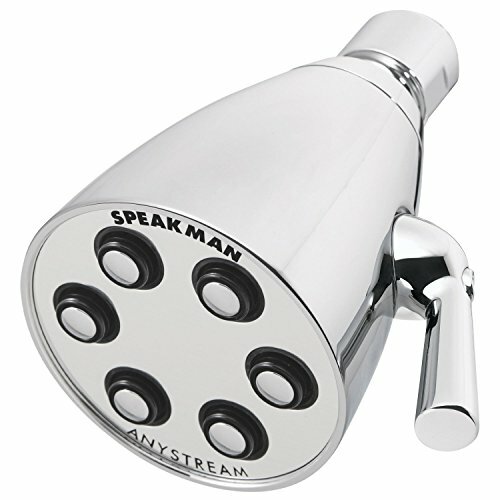 However, we believe that the Speakman Anystream High Pressure Adjustable Shower Head, although pricier than some, can be a superb option for most people. This fixed shower head has water flow settings – including the popular rainfall – that allow you to get the most comfort out of your shower but makes it as simple as possible to switch between each setting with the rotating handle. Speakman’s patented plunger technology also makes this unit stand out for homes that experience low water pressure to give them a bit more power in the shower without clogging up the jets. 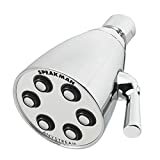 The Speakman Anystream may not be your top choice, but our helpful reviews give you some other options for fixed, handheld, and rainfall showerheads so that you can find the right the best shower heads for each of your bathrooms.